For more than 30 years, the lawyers of Schochor, Federico and Staton, P.A. have provided high-quality legal representation to the residents of Washington D.C. and Maryland. The award-winning law firm helps victims of medical malpractice secure financial compensation from negligent healthcare practitioners who make egregious errors. 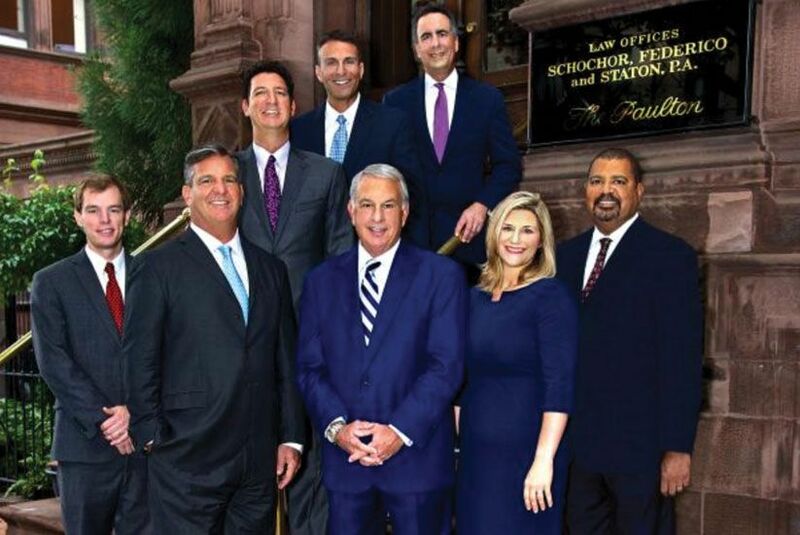 Jonathan Schochor, Philip Federico and Kerry Staton founded the firm in 1984 with the goal of providing impeccable representation to each and every one of their clients. The firm’s efforts have paid off over the last three decades, recovering more than one billion dollars in verdicts and settlements on behalf of their clients, along with receiving a variety of prestigious awards and recognition from peers throughout the legal community. The partners, Jonathan Schochor, Philip Federico, Kerry Staton, James Cardea, Scott Kurlander, Jonathan Goldberg have all been included among The Best Lawyers in America®, as well as Super Lawyers®. The firm has also been designated with the highest rating afforded by Martindale-Hubbell® and has been listed in the Bar Register for Preeminent Lawyers®. Schochor, Federico and Staton, P.A. has also won the Litigator Award, which honors only the top 1% of all lawyers in the nation. These honors are only awarded to firms that consistently demonstrate a thorough knowledge of the law and meet high ethical standards. The lawyers of Schochor, Federico and Staton, P.A. have proudly earned these accolades while establishing a successful medical malpractice and class action plaintiffs’ law firm. The firm maintains offices in Baltimore and Washington, D.C., and their attorneys primarily represent clients in Maryland and D.C. However, on special motion, and with approval of courts elsewhere, their attorneys participate in cases throughout the United States. They have been specially admitted, on a case-by-case basis, by courts in several other states. The attorneys of Schochor, Federico and Staton, P.A. are passionate about helping individuals and families of victims of medical malpractice and negligence. Their dedication and expertise helped lead what is reported to be the largest single perpetrator, sexual abuse class action settlement in the country’s history. Schochor, Federico and Staton, P.A. has recovered compensation totaling more than one billion dollars for its clients, inside and outside of the courtroom. Their partners share their legal knowledge and experience, both locally and nationally, by speaking to legal and medical professionals about malpractice-related cases. The efforts of the attorneys and staff at Schochor, Federico and Staton, P.A. extend far beyond the courtroom and law office. Their team has developed a lasting culture of service and philanthropy, along with a genuine desire to meaningfully impact the surrounding communities and society as a whole. These convictions are demonstrated by the firm’s commitment to volunteering, thought leadership, and financial support of life-changing charities. As volunteers within their communities, Schochor, Federico and Staton’s lawyers have lectured medical students, interns, residents and attending physicians at Johns Hopkins Hospital, Medstar, and University of Maryland Medical Systems about effective strategies to prevent medical malpractice. The attorneys and staff at Schochor, Federico and Staton have also donated hours of their time to Habitat for Humanity and have mentored minority students from area high schools and colleges. They support nonprofits, having donated hundreds of thousands of dollars to important causes over the years. Schochor, Federico and Staton, P.A. is committed to strengthening its community while providing clients with exemplary representation. Medical malpractice law deals specifically with mistakes, omissions, negligence, and wrongful acts committed by doctors and other medical professionals–acts that frequently have a life-long impact. The firm is most proud of the impact that it has had upon its clients. Through their decades of service, Schochor, Federico and Staton, P.A. has gained a unique understanding of the challenges faced by victims of negligence. The firm uses this knowledge and skill to ease these burdens and provide clients with the closure they deserve. Schochor, Federico and Staton, P.A. helps clients rebuild their lives and restore their quality of life.